Drink before attempting to swallow the pill. 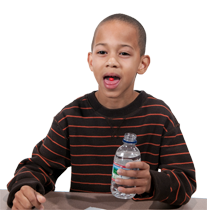 Taking a few sips of water prior to attempting to swallow a pill can hydrate the throat and make it easier to swallow the pill. Tablets and capsules are harder to swallow when the patient’s mouth is dry, which often happens when they are sick. Use cool, never hot, liquids. Washing down a pill with hot or warm liquids may cause it to dissolve before it gets to the stomach where it can be absorbed. Try carbonated beverages. 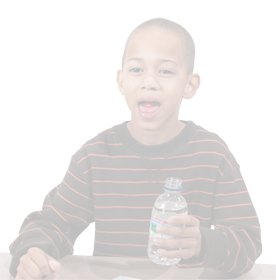 Sometimes swallowing pills with an ice-cold carbonated beverage (e.g., ginger ale, lemon-lime soda, sparkling water) can aid in transporting pills quickly and help with swallowing. Let the pill float. 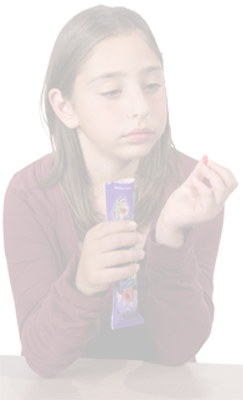 Adding a pill to water or other liquid being held in the mouth may make pill swallowing easier. Two-Gulp Method: Try the two-gulp method, which helps to fold down the epiglottis (the flap of cartilage at the back of the throat that protects the airway during swallowing). Place the pill on the tongue. Take one gulp of water and swallow it, but not the pill. Immediately take a second gulp of water and swallow the pill and the water together.